Combine pancake mix and cinnamon together in a bowl with a wire whisk. Add 8 beaten eggs, pumpkin and milk. Stir well. Heat coconut oil or butter in the pan and drop by 1/4 cup fulls. Watch the edges, when the bottom layer is set flip over, about 3 minutes at 350 degrees. As they finish place on the cooling rack. This keeps them from getting soggy from the steam. Once cooled you can stack in order to make more room. Layer between wax paper, wrap and freeze. Top with real maple syrup, bananas, fresh blueberries, semi sweet chocolate, pecans, powdered sugar...the options are endless! 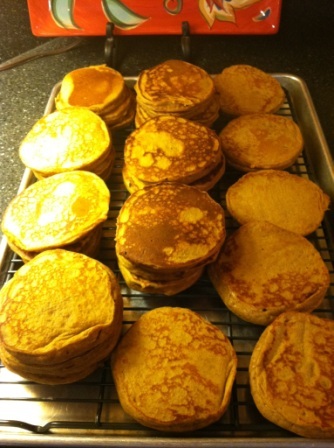 We love making healthy pancakes at our house too, and it's so easy to make extra to freeze. But your tip on setting a baking rack out as a cooling rack is genius! I can't believe we never thought of it:) Thanks for sharing! What brand of mix did you use? We use to use Pamelas but cannot any longer. We are on a nut and dairy free diet and the Pamela's mix contains almonds and buttermilk. Thank you!